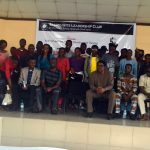 Pastor, author and principal consultant of Leadership Edge Consult, Ayo Fadumiye was the guest speaker at the Salimo-Wits Youth Leadership Training (SWLC) held at the National Library, Yaba, Lagos on Saturday 5th August, 2017. The theme for the August edition of the Salimo-Wits Youth Leadership training was ‘Spirit of Leadership.’ The training programme which commenced shortly after 1pm featured inspirational videos on “Lead India and motivational leaders”. The topic ‘Boss vs Leader’ was discussed during the Let’s Talk and icebreaker session by the participants. The guest speaker Ayo Fadunmiye described the spirit of leadership as the spirit of self-discovery and self-mastery. In the words of the speaker, “Life becomes relevant when you discover your gifts and sharpen your skills”. He charged the youths to pursue excellence and cultivate the right association. He stressed the need for the participants to read books and attend seminars that would help them discover their gifts and talents. This was followed by presentation of certificate of participation and consolation prizes to youths who entered for the the Salimo-Wits Essay and Entrepreneurship Competition. The President and Founder of Salimo-Wits Foundation, Ambassador Dan Ekoko enjoined the participants to shun vices such as terrorism, kidnapping, cultism, internet crime and look within to discover their true selves. He urged the youths to desist from grumbling and complaining, rather contribute their quota towards making Nigeria a better place. The programme was concluded with photo session and departure at 4:10 pm. The SWLC training is the signature training programme of Salimo-Wits Leadership Initiative; organized three times a year for in-school and out-of-school youths.